The competition was on and, despite heavy downpours, high seas and hefty wind gusts, nearly all registered anglers turned out for last Sunday’s sold-out Wentworth Marina Striped Bass Tournament in New Castle. Sponsored by Mercedes-Benz, the annual event raised $110,000. 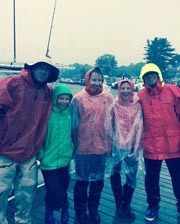 Even though entertainment and marine educational programs had to be cancelled, the hearty participants welcomed the warming tent, music, raffles and lunch buffet provided at the Wentworth Marina prior to the highly anticipated awards ceremony. Twenty-nine trophies were handed-out with the largest striped bass caught by Sam Bonner in the Schoolies category, age 11-13. Sam’s fish weighed in at 41.25 inches. The tournament’s mackerel anglers also had the largest fish caught in the Schoolies category: Bennett Hayes brought in a 17.9-ounce fish. 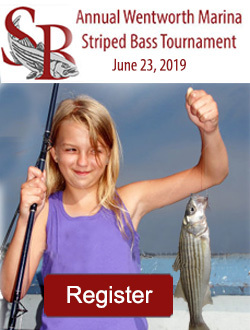 This year tournament proceeds will benefit the following Seacoast organizations: Blue Ocean Society, Northeast Passage, Zebra Crossing and Coastal Conservation Association of New Hampshire. All selected organizations providing services and programming supporting children and their families. Additional information on all 2015 beneficiary organizations, sponsors, as well as previous LHCF recipients and winners can be found at www.stripertournamentforkids.com.